Recently I wanted to use a horizontal navigation menu on a website. I wanted the items in the menu to be evenly distributed across the width of the page, but also butting up against each other, with no space between each item. The other requirement was that the spacing between the text of each item should be equal. I’ve structured the menus using the standard unordered list method. I’ve also included submenus under option one and option four. I couldn’t get the submenus to display properly in IE7, so I have used a conditional comment to keep them hidden in IE 7 and below. The length of the text for each item varies so you can see how the menus look. For all the menus I’ve applied a black background to the ul. You wouldn’t want to do this in real usage, but helps make clear the relation between the list items and the ul for the purposes of the example. This lays out the menu like a table, with each column the same width. Table layout is not supported on IE7 and lower. Unfortunately, if you have a long menu entry, then that entry will be wrapped onto multiple lines. This can cause issues, as that one menu item becomes taller than the other items. To get round this, I have applied the CSS rule of white-space: nowrap to the anchors. This prevents the text wrapping, however this does mean that the long text will get cut off when the menu is forced to a small size. Next up, we have another menu with table display, but table-layout: auto;. This makes each ‘column’ of the ‘table’ adjust to the size of its contents, rather than making each column the same width. The issue with this method of display (at least for me), is that the larger menu items have more ‘padding’ applied to them than the smaller menu items. Table display with auto layout when a sub menu is displayed. This can be resolved by using absolute positioning on the sub menus, but then you can end up with sub menus that are smaller in width than their parents (which looks strange to me). Flex display can be used to set the menu out exactly how I wanted, a pure CSS solution. Unfortunately it is not widely supported by browsers at the moment. In Firefox it works nicely. Chrome / Webkit requires a vendor prefixed syntax. IE10 is meant to support a vendor prefixed syntax, but I haven’t been able to get it working. sets the ul up as a flex container. says that we want the children (list items) laid out horizontally in a row. On the list items we set flex-grow: 1;, this is what makes the list items automatically stretch to fill up the menu width. Unlike table display with auto layout, flex adds the same amount of ‘padding’ to each list item. A very good description of the flex layout can be found at CSS-tricks – A Complete Guide to Flexbox. Update 2013-08-03: Thanks to Paul O’B over on the sitepoint forums, who pointed me to this guide for Flexbox Syntax for IE10. In IE10 you must add the rule -ms-flex: 1 to the list items, rather than -ms-flex-grow: 1. And display: -ms-flexbox to the ul / ol rather than display: -ms-flex. However, Flex works differently in IE10 than how it does in Chrome and Firefox. In IE10 the menu is displayed with each item having the same width, the same as a fixed layout table display. I haven’t tried the IE11 preview, so I’m not sure how IE11 will treat Flex display. This method was developed by CSS guru Paul O’B and posted in reply to my question over on the sitepoint forums. Unfortunately it needs a very specific way of writing the HTML for the menu, one that you are unlikely to come across in actual usage. My examples are using the same HTML as the other examples, and so I was not able to replicate the effect. However, you will see that the anchors are justified (but have space around them). You can view Paul’s example here: Equally justifed menu – Firefox only. The last example uses a fixed table layout again, but I have added separators between the items. The separators are just a pipe character | added as CSS generated content. You can use the same CSS to add separators to a flex layout. The :after pseudo class is not supported in IE7 and below, so this won’t work for that browser. It works by making the list items wrap to their contents. After doing this it can calculate how much spare space is left in the menu. Then this spare space is divided between the number of list items, and applied as padding to the anchors. If you do not specify a value, a default value of 5 will be used. The justify menu function will not work properly with menus where margins have been applied to the list items or padding has been applied to the ul / ol. 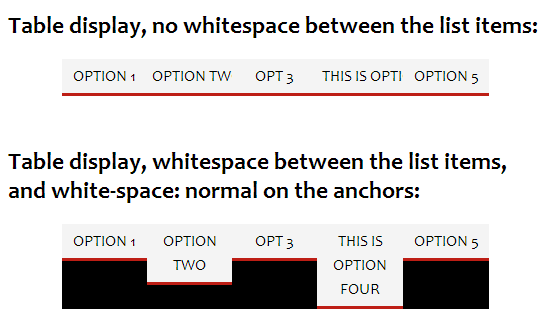 *the same amount of padding to the anchor element contained in each list item. //then the last item will be pushed down onto the next row. In the example above I am checking a variable IE to see if it is equal to 6. You will need to make sure this variable is set, as it is not some special variable automatically set by IE. In the example page I am using IE conditional comments to set the value of the IE variable to 6 (for IE6), 7 (for IE7), or false for all other browsers. You will also need to modify the parts where the original inline css styles are saved and restored. Otherwise when the window is resized to the minwidth, the inline display will still be applied to the anchors. If you have any comments or suggestions (I’m sure improvements could be made), please leave a comment below or you can email me on info@. I really liked this summary of methods with code and example usage all in one file. For the Justified example I wonder whether there is a way to keep the “ul li a” positions same with and without :hover? As it is you get into an flickering loop when you hover at the end of the string. Thanks for the feedback Roland. The justified CSS examples flicker when the item contains a sub menu. Since the main menu items didn’t display how I wanted, I didn’t really look into fixing the flickering (inaccessible) sub menus issue with this CSS method. I expect it can be fixed, I’ll take a look at it sometime and post back here. Long delay, but I’ve had a look at this now. The flickering can be resolved by setting float: left on the ul submenu. However, the submenu takes up the width of the entire menu when it is displayed. I can’t figure out a way to prevent this while keeping the parent lis as display: inline, which is needed for the justified one to work. I think the justified css menu would only work okay for single level menus with no submenus.